For many of us who grew up evangelical, the word “compromise” has always been a bad word. It means to allow non-Christian values and influences to corrupt your devotion to Biblical truth. Frank Schaeffer, the son of the evangelical leader who started the modern Religious Right, claims that our government shutdown and its Tea Party architects cannot be understood apart from this fundamental characteristic of the evangelical ethos. Insofar as the Tea Party is an evangelical phenomenon, I think he may be right. Evangelicals are raised to be a people of no compromise. And it all starts with an understanding of Jesus’ cross that makes God into Darth Vader and turns us into cookie-cutter stormtroopers devoted to His imperial cause. Why did Jesus have to die for our sins on the cross? For most conservative evangelicals, that question has a very simple, straightforward answer: because God has zero tolerance for sin. God is holy, and what holiness means is God’s refusal to compromise His expectations for perfect adherence to the laws He lays out in the Bible. Since no human being other than Jesus has ever been perfectly obedient, God had to create a means by which His expectations for perfection would not be compromised by showing mercy to an imperfect people. So instead of torturing every human being forever because of their imperfection, God pours out His wrath on His own Son to show the world that He is a God of no compromise who will pour out the same wrath eternally on people who won’t accept Jesus as their Lord and savior. One of my favorite movies, The Usual Suspects, is premised on a similar gesture of no compromise. The main character, Keyser Soze, is a Turkish gangster whose rivals kidnap his children and hold guns to their heads, demanding that he give their business to them. To show that he is a man of no compromise, Keyser Soze shoots and kills his own children rather than capitulate to their demands. The Star Wars films cover a similar theme in the way that Darth Vader’s uncompromising obedience to the Emperor is measured by his willingness to kill his own son Luke Skywalker. Vader’s ethical system measures “good” as uncompromising obedience to his master’s will; it is irrelevant whether this “good” harms or benefits other people. 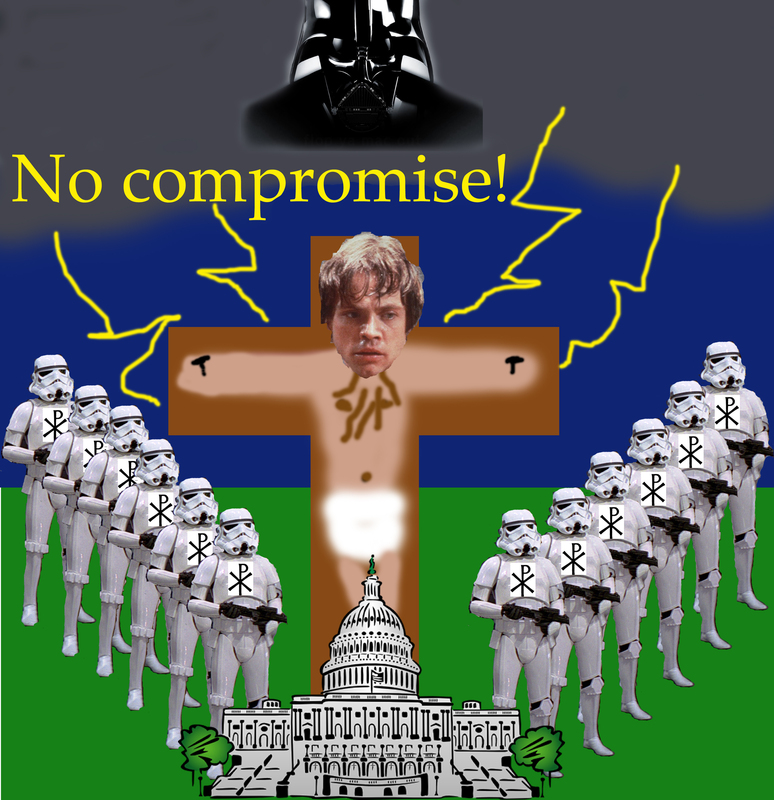 A cross whose purpose is to uphold God’s uncompromising intolerance for imperfection creates a God in the image of Keyser Soze or Darth Vader, because it defines God’s goodness not according to any sort of benevolence towards humanity, but as His demand for nothing less than perfect conformity to His will. In such a view, goodness is whatever God wills, as opposed to God’s will being expected to reflect a goodness that could be considered independent of its association with God. Under this “Darth Vader” account of the cross, the way to be on God’s good side and safe from His wrath is to accept the validity of Jesus’ crucifixion for our sins. This means agreeing that God was right to torture and kill His Son rather than compromise and allow people who have not perfectly obeyed the Bible to join Him in heaven without accepting Jesus’ sacrifice on their behalf. The way to show that you really accept the legitimacy of God’s uncompromising stance is to become a person of no compromise yourself, or, to stay in the Star Wars metaphor, an imperial stormtrooper. The purity of your lack of compromise is measured according to the degree to which you are “Biblical” about everything you do. People are Republicans for a variety of reasons just like people are Democrats for a variety of reasons, but a stormtrooper evangelical Republican must categorically reject any idea that is generated by a Democrat because accepting it would amount to a compromise of worldview. Democrats are understood to be the party of secular humanism since their issue positions are shaped by values presumed to be common to humanity rather than being derived directly from Christian scripture. Christians who are either Democrats or accept ideas generated by Democrats have been compromised by secular humanism. This is why it doesn’t matter whether Obamacare is actually “socialist” or not. It cannot be modified or tweaked, because it was derived in the wrong worldview. Thus, it must be rejected absolutely or at least sabotaged to the degree possible until a new law can be written from scratch by someone who has the right worldview (even if the new proposal looks strikingly similar to Obamacare, c.f. Darrell Issa). I don’t know how many Tea Party members of Congress are evangelical, but their actions sure seem to reflect the attitude about compromise I learned in my evangelical upbringing. The anguishing irony is that Jesus’ cross is actually supposed to make Christians who accept His sacrifice for our sins into people who are the most capable of compromise. What it’s supposed to save us from is not God’s intolerance for our mistakes, but our defensiveness about our mistakes (which is what God cannot tolerate for the sake of our peace with each other). People who think they are infallible destroy the possibility of community. That’s precisely what our government shutdown is putting on display for us, and I’m not saying that either side has a monopoly on this delusion of infallibility, just because one side is more likely to share my evangelical roots. One of the greatest freedoms that we gain as rational creatures who need to justify our actions and make sense to ourselves is the freedom to be wrong. On Jesus’ cross, God unilaterally takes the blame for our sins so that we can confess them and repent instead of insisting on our infallibility. So from now on we regard no one from a worldly point of view. Though we once regarded Christ in this way, we do so no longer. Therefore, if anyone is in Christ, the new creation has come: The old has gone, the new is here! All this is from God, who reconciled us to himself through Christ and gave us the ministry of reconciliation:that God was reconciling the world to himself in Christ, not counting people’s sins against them. And he has committed to us the message of reconciliation. We are therefore Christ’s ambassadors, as though God were making his appeal through us. We implore you on Christ’s behalf: Be reconciled to God. God made him who had no sin to be sinfor us, so that in him we might become the righteousness of God. The “righteousness of God” described here is not God’s intolerance for imperfection, but God’s willingness to take the blame for our sins so that we can be honest with ourselves and with Him, thus enabling our authentic reconciliation. We “become” the righteousness of God when we accept both His unconditional mercy toward our sin and the duty to extend that mercy to others as equally forgiven sinners. To regard other people from a “worldly point of view” is to see them as either tools or obstacles to our self-interest, which we consider to be infallible. When we regard other people “in Christ,” our goal for our relationships with them is the same reconciliation we have received from God. This means that we try to understand where they’re coming from. It means that we validate as much as we can about their perspectives for the sake of integrity and to build trust, even if we disagree. It means that we’re willing to compromise because the greater goal is reconciliation, and we understand that even if we’re trying our hardest to be faithful to God’s Biblical teachings, our grasp of these teachings will never be perfect and we have a lot to learn, even from people who don’t call what they know God’s truth. I realize that not everyone behind our government shutdown is necessarily a Christian, but I do pray that God would raise up some ministers of reconciliation among them. That would bear witness to the beauty that Jesus’ cross is supposed to be, a cross that doesn’t speak of a Father so filled with rage that He had to take it out on His Son, but rather a Father who loved all of His children so much that He allowed His Son to pay the price for their mistakes so they could approach His throne with perfect honesty and freedom. This entry was posted in Politics and tagged 2 Corinthians 5, Compromise, Cross, Crucifixion, Darth Vader, Father, God, government, Jesus, Keyser Soze, Obama, Obamacare, Penal substitution, Reconciliation, Shutdown, Tea Party, Wrath. Bookmark the permalink. ← Would you refuse to negotiate if…? Re: Compromise. The administration has adopted a “give me everything I want right now with no restrictions, and I’ll discuss negotiating giving you some – or maybe none – of what you want later on… if I feel like it” posture. The ball is in the administration’s court. As long as they want to keep playing with the lives of other people demanding unconditional surrender which they and their supporters and the msm redefine as compromise, the game will go on. At the present, they are to busy playing. Now is not the time for them to pay attention to the lives of other people. The next election cycle is still far away. I disagree (or at least want clarification) with some elements of this post, but then, I’m a conservative evangelical so what would you expect? 😉 I like reading your blog because even when I disagree strongly I often find that there is something I can agree with and/or be challenged by. I also like to remind myself when I feel you’re being unfair to an opposing position, that the conservative blogs I read (Mere Orthodoxy for one) often seem just as uncharitable to the opposing position. I appreciate your blog and intend to continue reading it. That being said, I DID disagree and would to voice some of it. Firstly, when you say, “In such a view, goodness is whatever God wills, as opposed to God’s will being expected to reflect a goodness that could be considered independent of its association with God,” why on earth SHOULD God submit to an outside standard of goodness rather than the other way around? Goodness comes from God, after all. And a god that we can rest assured that he will never do anything we disapprove of is entirely a god of our own conception, is it not? Secondly, the “ministers of reconciliation” passage is clearly, as you pointed out, speaking first of our reconciliation to God and only THROUGH that reconciliation is it speaking of our reconciliation to each other. 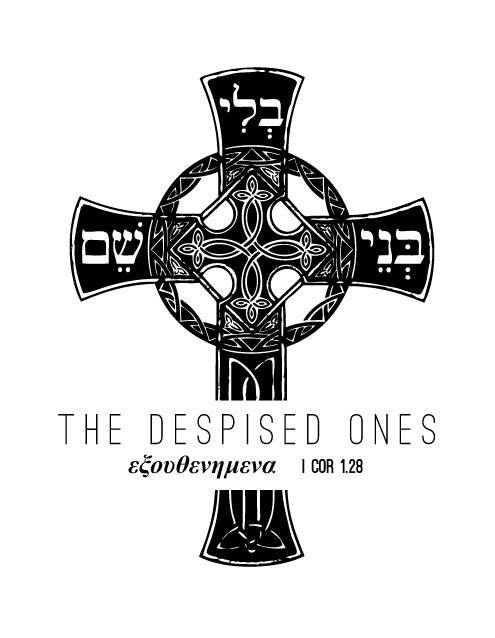 Peter, Paul, and John in their epistles are very hard on what they call false teachers, because such teachers are perverting the Gospel and preventing reconciliation to God. The Gospel, after all, is not the Gospel of “I’m okay, you’re okay” (and I’m not saying you’re saying it is) but rather “of the forgiveness of sins.” What is reconciliation without repentance? And I hope that these issues I’m raising can be discussed without delving into the politics that form the context of your post. I’m trying to take a break from politics. I just want a healthy dialogue about the theology that’s driving each of us right now. I’d like to affirm as well that my goal is to “validate as much as we can about [each other’s] perspectives for the sake of integrity and to build trust, even if we disagree.” God bless! Good stuff. Thanks for the pushback. I would say that just because God defines goodness doesn’t mean that goodness is arbitrary and incomprehensible to us. The Calvinist strand of conservative evangelicalism in particular is heavily influenced by nominalism, which says that there are no universals beneath the particularity of existence. There is no form of good; good is pure fiat. I disagree with that. Sure God defines what good is. But when someone calls evil good and says it’s from God, I don’t necessarily have to find a chapter verse Biblical citation to challenge that if I can do so on a common sense level. Paul’s basis for condemning pagan society in Romans 1 is that a basic comprehension of good and evil should be self-evident to humanity even apart from Biblical revelation. I do agree that we ultimately need to be reconciled to God in order to be reconciled to each other. But I think that our lives should be a cruciform imitation of Jesus on the cross which is to say that we are unilaterally conciliatory towards other people; we embrace the world even as it drives nails into our hands. It doesn’t mean that we betray the truth. It does mean that out of integrity, we interpret others’ perspectives as charitably as we possibly can and see it as our duty to win them not to our position but to “peace and mutual edification” as Paul would say. Keep going with this as much as you want. Thanks for the opportunity for dialogue! Christ didn’t die for us, because we repent — but that’s the common evangelical perspective. We repent because Christ died (and lived) for us. Can I just say, briefly, that I don’t think that’s the common evangelical perspective at all? And that that’s not what my question was driving at? David’s right. The way you’ve rearticulated what he said, Jim, is a conflation. David is making a distinction between God saying look, I’m not bothered by your sin versus your sin bothers me but I forgive you. Now what I would contend nonetheless is that people who really know they have been forgiven by God are consequently going to be conciliatory rather than uncompromising towards other people with whom they disagree. Being conciliatory by looking for points of agreement and proactively seeking to build trust is not analogous to a gospel of cheap grace where sin doesn’t matter because ideological difference is not analogous to sin. I pray for this reconciliation in our government and among its leaders too. Great analysis. I’ve definitely seen the line drawn between a faith that is based on absolute unwillingness to compromise and actions like the government shutdown. I hadn’t directly drawn that correlation to their atonement theology as well, but it does make a lot of sense. Yeah I think so much begins with how we view the cross and what we think it tells us about God. Your graphics for this post remind me of a Monty Python skit. Funny! I was totally thinking of that scene when Gods face is in the clouds. “It means that we’re willing to compromise because the greater goal is reconciliation, and we understand that even if we’re trying our hardest to be faithful to God’s Biblical teachings, our grasp of these teachings will never be perfect and we have a lot to learn, even from people who don’t call what they know God’s truth.” The value of reconciliation is the reward of community.